Micromax FRP ADP Mode cipher SPD Frp Unlock Bootloader mil account remover cipher or Unlock Pattern Lock transmission Lenovo FRP remover Motorola FRP remover Deep FRP remover HTC FRP remover Yuforia FRP remover Yureka And All Android mobile Unlock Fastboot tools Bootloader Xiomi FRP removerFrp pattern password. 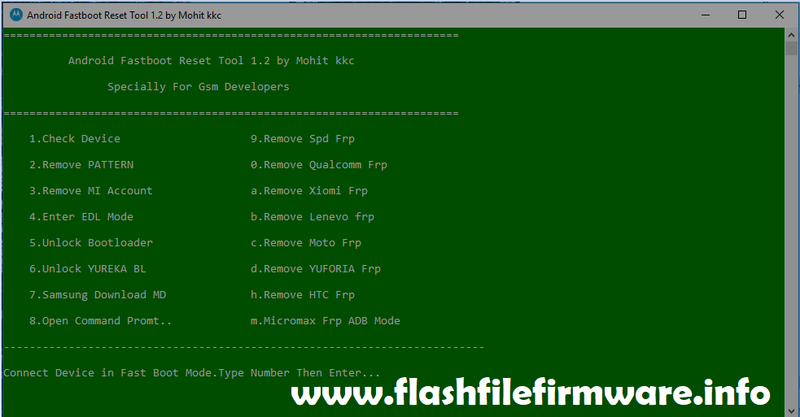 The Android Fastboot Reset Tool is a Command Prompt gadget which shows decisions to perform specific exercises. 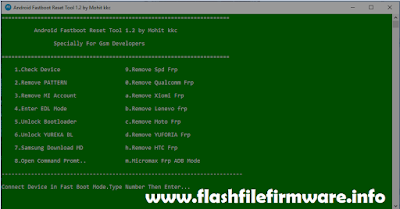 The accompanying are a bit of the decisions or features offered by the Android Fastboot FRP Reset Tool 1.2. Basically, Android Fastboot Reset Tool is a bypassing gadget for Android Smartphones. This Android Fastboot reset 1.2 Tool limits with in every practical sense every android mobile phone. Furthermore it supports various Android Smart-phones including Lava Iris Smartphone, Samsung Smartphone, Lava Smartphone. Directly you will download Android Fastboot reset mechanical assembly PC programming most exceptional shape with no expense. It works for windows pc structure in a manner of speaking. The most current variation of Android FastBoot reset Tool is directly released, and you may download it by taking off to the downloads zone.